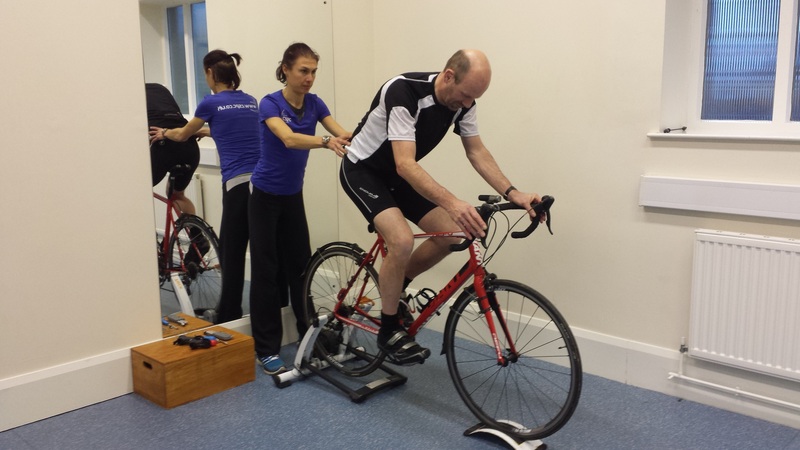 The physiotherapists at CSPC are experienced in assessing and treating cyclists on a regular basis and we have been in partnership with a number of local cycling clubs in the area for some time now, providing physiotherapy and injury prevention for their members. Cycling is a great sport with the bonus of being non-weight bearing, so is great for all ages, shapes and sizes without straining the joints too much. Injuries tend to be less frequent in cycling than other sports such as running and rugby but they do happen due to the repetitive nature of the sport. 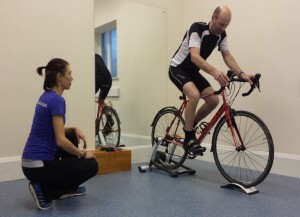 During the Cyclist’s Full Body MOT with bike fit at CSPC, the physiotherapist will look at your body from head to toe assessing strength, stability, flexibility, proprioception, biomechanics, breathing, functional movement and your cycling technique and efficiency. We then get you on the bike, in your cycling gear and ask you to pedal in the position you will be in the most frequently, or your ideal race position. We observe from all angles, taking photos/video, certain measurements, assessing movement patterns and pedal efficiency and using an experienced “eye”. Identification of any biomechanical restrictions/issues e.g. leg length discrepancies, pelvic asymmetry, central instability and muscle imbalances. By watching you cycle, the physiotherapist at CSPC will identify aspects of your technique that can be fine-tuned to help improve your technique, efficiency and stability. They will provide specific drills and exercises for you on and off the bike and go through these, correcting as required, and include these in your personal exercise plan. Adding the drills and exercises as part of your warm up or into your strength and conditioning program, can also help reduce fatigue, risk of injury and discomfort and enhance power output, performance, and your enjoyment on the bike. Whether you’re a competitive cyclist or just someone who enjoys a social ride, there are many things you can do to help improve your time on the bike! Cost: Up to 2.5 hour Cyclist’s Full Body MOT with bike fit including assessment, treatment and a detailed report is £180 with a physiotherapist.